There is only one surefire way to increase net worth over time: to save. To save more, you need to either earn more or spend less. RewardBus is the only personal finance website that focuses on both sides of the equation. We provide information on budgeting and spending, helping the average household reconsider some of their purchases. We also provide information on many of the various forms of "new economy" earnings (TaskRabbit, Uber, Lyft, PostMates, etc.) to give information on earning more money in your spare time. 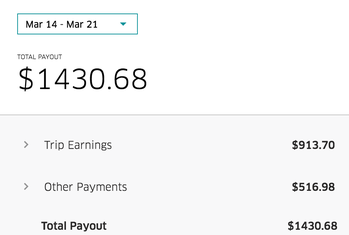 In fact, Uber offers you $1,000 for signing up as a new driver. The travel blog will be located in the blog section of the site located on the top of the banner on the page. In here will be tales from the road, savings maneuvers for travel and perhaps some cool travel events along the way. Cameron Daniels was able to earn $2,000 in credit card rewards last year and traveled mostly on sign-up bonuses. The financial recommendations section will be integrated into our overall philosophy of choosing the best low-cost advice a money manager should use for themselves. No-fee banks, low-commission trading, best IRAs and low-cost mutual funds are the overall feel for the website's recommendations. There will also be a lot of writing on specific credit cards rewards, how to earn them and how best to spend them. Thirdly, personal finance education will be a key pillar of the website. Beware of small expenses. Small leaks can sing a big ship. Underarching the entire credit economy is the fact that there is a significant number of people in the country (dare I say, world) that do not have a proper relationship with finances and the understanding behind them. 63% of Americans could not cover a $500 unexpected expense without cutting back on their budget, putting the money on credit or borrowing from friends and family. Hopefully, by emphasizing the ability to earn in your spare time and understanding the nuances of credit, we can help people understand more. We would love to hear from our fans. Be sure to follow us on Instagram, Facebook, Twitter (little buttons bottom of page) and sign-up for our e-mail newsletter. We can be reached at info@rewardbus.com . We look to be continuing to produce great content on a regular basis and would love to hear from our readers.